Help Center > Account Management > Account Settings > Account Management > How do I change my email address? Before changing your email address, check the scenario first. Have access to the email address or not? Scenario 1.1: The email address to replace is free and you have access to it: Go to My Account and click 'Change Email Address' . Scenario 1.2: The email address to replace is free and you have no access to it: contact Customer Service Team for help. If this email has been registered under other platforms of Alibaba Group, like AliExpress.com, taobao.com, etc., please release the email from that platform first before using it to register Alibaba.com account. 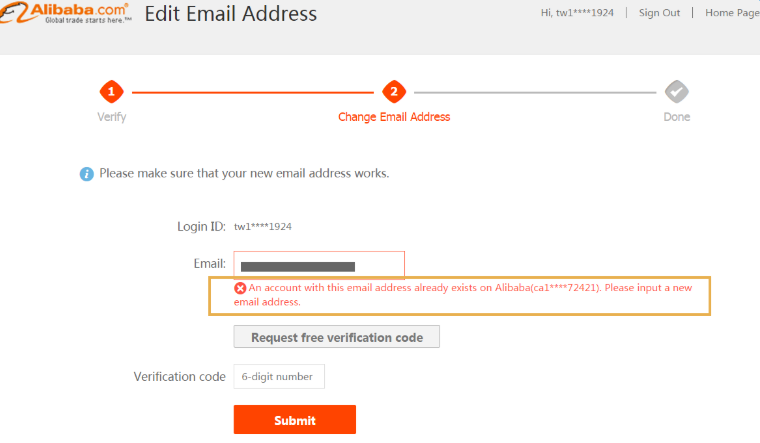 Scenario 2.2: The email address to replace is occupied and exists under another account on Alibaba.com: Please directly use the email address to sign in.